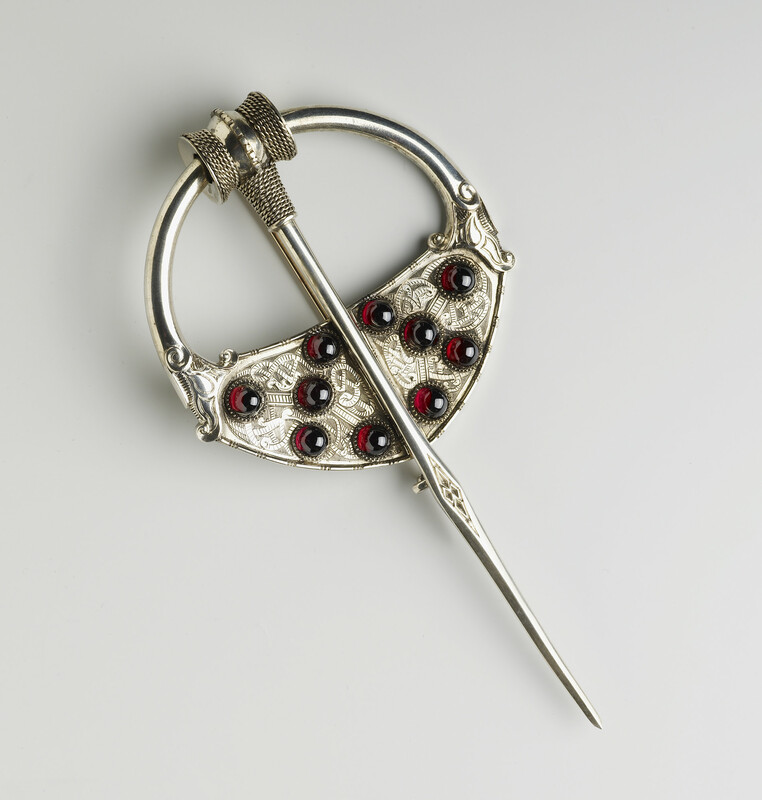 This brooch, based on an ancient prototype, is an example of a general revival of interest in Celtic history, and was chosen with the deliberate intent of showing royal patronage of the Irish jewellery trade. It was created by West & Son, one of the largest jewellers in Dublin, who contracted the work to the goldsmith Edmund Johnson. The brooch was acquired, along with another similar piece (RCIN 12457), during the royal visit to Dublin in August 1849, although the bill was not paid until the following January. 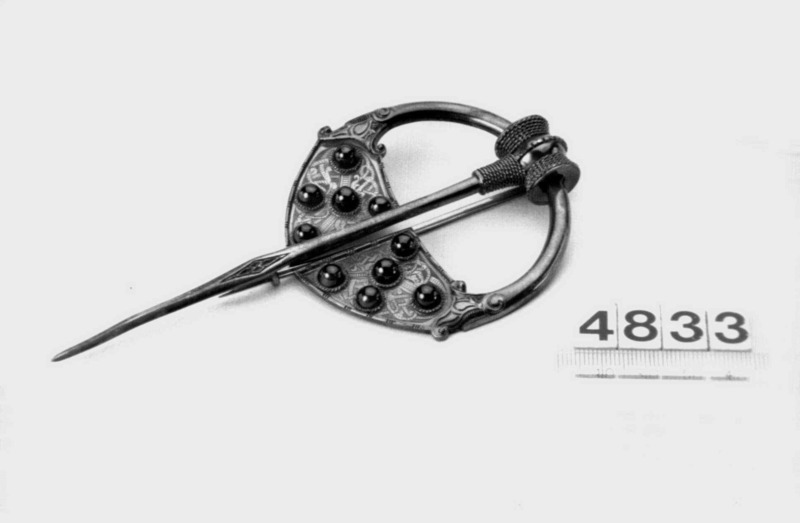 It is a variant of the Ogham Brooch, a ninth-century piece from Ballyspellan, which is engraved with Celtic knotwork (Dublin, National Museum of Ireland, inv. 1A:R89). The cabochon-cut garnets (or carbuncles) are a nineteenth-century enrichment, the original having silver beads. West's piece was also known as the Clarendon Brooch, after Lady Clarendon, wife of the Viceroy of Ireland, who owned one of the first versions of it. In their search for Celtic designs, both West & Son and their rivals Waterhouse & Co. trawled every available source in Dublin, including the Library of Trinity College, the Royal Irish Academy and various private collections. Both West and Waterhouse went on to display versions of this brooch at the Great Exhibition and again in Dublin in 1853. Purchased by Prince Albert and presented to Queen Victoria at Christmas 1849 having been acquired during the royal visit to Dublin in August 1849. [Victoria & Albert: Art & Love, London, 2010, pg 458] Based on an ancient brooch in the library of Trinity College, Dublin. (QV's inventory of Jewels, 1897, folio 180).